To preserve the age-old traditional and cultural values, people of Wanla revived Losar festival which was abandoned 9 years back. Featuring the performances of Baba, Meymey, Karok, Patimo and rChaspa Losar was celebrated with great enthusiasm on December 14. 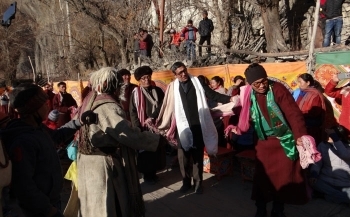 Jamyang Tsering Namgyal, CEC, LAHDC, Leh, chief guest appreciated the people of Wanla for reviving their Losar festival and said that this important step taken by the people of Wanla would set an example for many other villages to follow and revive their Losar celebration. He said Ladakh has a distinct cultural identity because of such fairs and festivals passed on from generation to generation carrying the custom and ritual of our glorious past. He felt the need to preserve such hereditary legacy. He appealed the younger generations to learn and inculcate the ancestral values in them and become true Ladakhis. He also talked about bringing the Losar festivals of different regions of Ladakh on the tourist map in the coming days. The initiative will not merely help to preserve the significance of Losar in all the villages but would further promote the winter tourism in Ladakh. Padmashree awardee Morup Namgyal gave a detail recounting of the modes and movements of Wanla Losar. Many locals, monks and enthusiastic youngsters attended the festival and contributed to the richness of the festival.